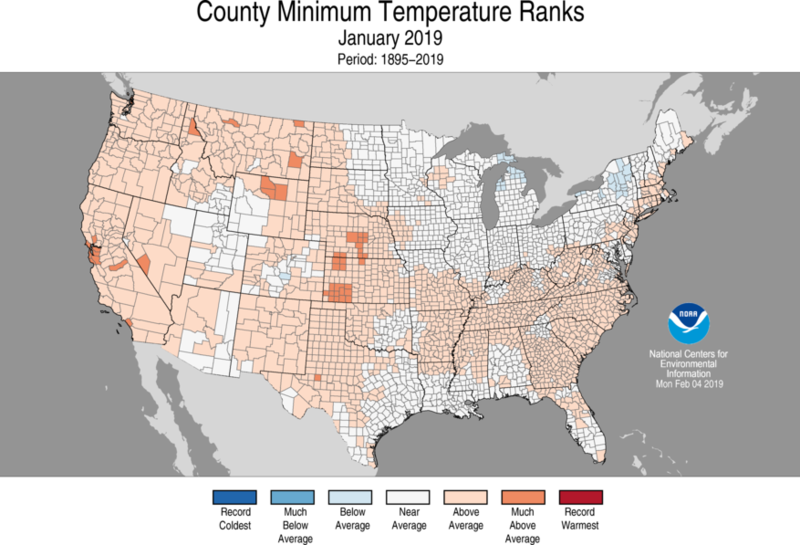 For January, the average contiguous U.S. temperature was 32.7°F, 2.6°F above the 20th century average, ranking in the warmest third of the 125-year period of record. Parts of the southeast, mid-Atlantic, High Plains and western U.S. were warmer than average. California ranked 11th warmest in January and was the only state to rank much-above-average for the month. No state ranked below average for the month. Below-average temperatures were confined to parts of Michigan, New York and Colorado. A significant cold air outbreak across the High Plains and Great Lakes at the end of January resulted in many record daily cold temperatures across the region. All-time record cold temperatures were reported in parts of the Midwest on 31 January including Moline, IL (-33°F, previous record was -28°F from 3 Feb 1996), Rockford, IL (-31°F, previous record was -27°F from 10 Jan 1982), and Cedar Rapids, IA (-30°F, previous record was -29°F from 15 Jan 2009). On 31 January, Mount Carroll, IL recorded a temperature of -38°F, which is two degrees colder than the current Illinois record of -36°F set on 5 January 1999 in Congerville, IL. This potential new record will be reviewed by the State Climate Extremes Committee in the coming weeks. 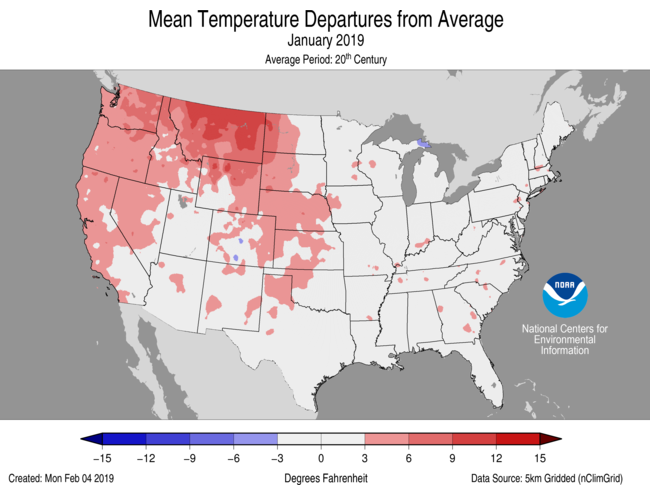 The Alaska January temperature was 7.4°F, 5.2°F above the long-term average. This ranked in the warmest third of the 95-year period of record for the state. Cold temperatures during mid-January were flanked by warmer temperatures at the beginning and the end of the month. The January precipitation total was 2.49 inches, 0.18 inch above the 20th century average. This ranked among the wettest third on record. 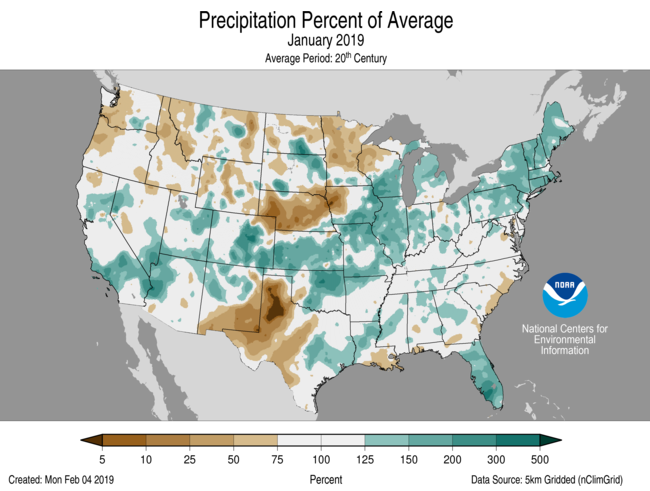 During January, much-above-average precipitation was concentrated across the Northeast, parts of the Midwest, High Plains and Florida. Above-average precipitation was scattered from California eastward to the Midwest and Great Lakes as well as into parts of the South and mid-Atlantic. Much-below-average precipitation occurred across portions of Nebraska and Iowa. Below-average precipitation was scattered across the northern Tier, Northwest and parts of New Mexico and Texas. On January 20, up to two feet of snow fell across portions of the Northeast contributing to a record snowiest January for Caribou, ME — 59.8 inches. This shattered the previous record of 44.5 inches set back in 1994 and nearly broke the all-time snowiest month on record for Caribou (59.9 inches), which occurred in December of 1972. According to the 29 January U.S. Drought Monitor report, 16.5 percent of the contiguous U.S. was in drought, down nearly 5 percent from the beginning of the month. January 6-7: Strong storm impacts southern California: High intensity rainfall caused mud and debris flows and flooding in the vicinity of the Woolsey burn scar near Malibu. This resulted in closure of Highway 1 in the area as well as various roadways in the Santa Monica Mountains. In central California, high winds resulted in downed trees and power outages in the Central Valley. As the storm moved east, winter storm conditions resulted in 56 vehicle accidents in Utah. There were also many accidents in the Sierra Nevada area; Interstate 80 closed for nearly an 18h period over Donner Summit. Numerous car accidents were reported in eastern Idaho and Montana as well associated with this storm event. Mercer County, Pennsylvania, had its first January tornado on record (since 1950) when an EF-1 tornado snapped and uprooted trees on January 8. A major storm moved through the region from January 19 to 21. Storm snow totals were up to 24 inches (61 cm), with the greatest amounts in New York and northern New England. The storm also produced ice accumulations of up to 0.60 inches (1.5 cm), with the greatest amounts in Connecticut, and rain totals of up to 4 inches (102 mm), with the greatest amounts in eastern Massachusetts and Rhode Island. The precipitation and wind gusts of up to 61 mph (27 m/s) contributed to downed trees, power outages, travel disruptions, and flooding. An Arctic front produced intense snow squalls that led to a few multi-vehicle accidents on January 30. Behind the front, cold air poured into the region and strong winds created subzero wind chills. A multi-day lake-effect event unfolded east of Lakes Erie and Ontario in New York, with snow totals up to 37.6 inches (95.5 cm) south of Watertown and up to 21 inches (53.3 cm) in Buffalo from January 29 through February 1. Whiteout and blizzard conditions led to extremely difficult travel, with travel bans enacted and some road closures. Caribou, Maine, recorded its snowiest January on record with 59.8 inches (151.9 cm) of snow. This was just 0.1 inches (0.25 cm) short of tying its all-time snowiest month, December 1972 with 59.9 inches (152.1 cm). January 21-22: Santa Ana winds in California; winter storm impacts in Intermountain West: Strong Santa Ana winds (typical for this time of year) in southern California caused downed trees and power outages. Two people were killed when tree fell on house in San Diego. Further inland, winter storm conditions associated with this event resulted in 200 crashes across Utah and road closures due to poor driving conditions and avalanches as well as power outages and flight cancellations. Road closures were observed in northern New Mexico, Wyoming, and Montana; Montana observed school closures associated with this event as well. At least ten deaths in the Midwest were attributed to the weather in the last couple days of January. State of emergency were declared in Wisconsin, Illinois and Michigan. More than 1000 flights were cancelled at Chicago’s O’Hare Airport, Amtrak service to and from Chicago was cancelled on the 30th, classes were cancelled at schools and universities on the 30th and 31st, and even postal service was suspended on the 30th in parts of Minnesota, Iowa, Illinois, and Wisconsin to limit postal carrier’s exposure due to the dangerous cold and wind chills. In Michigan and Minnesota there were calls to lower thermostats due to the enormous natural gas demand for heating. Wind chills dropped to the -50s and -60s in °F (-46 to -57 °C) in the upper Midwest. In the High Plains, the eastern Dakotas were most impacted by this event, although the bitter cold was experienced in other areas as well. Minimum temperatures bottomed out in the -40s with wind chills as low as -62.0°F (-52.2°C), which was observed at the airport in Grafton, North Dakota. Numerous locations set new daily records for both lowest maximum and lowest minimum temperatures. 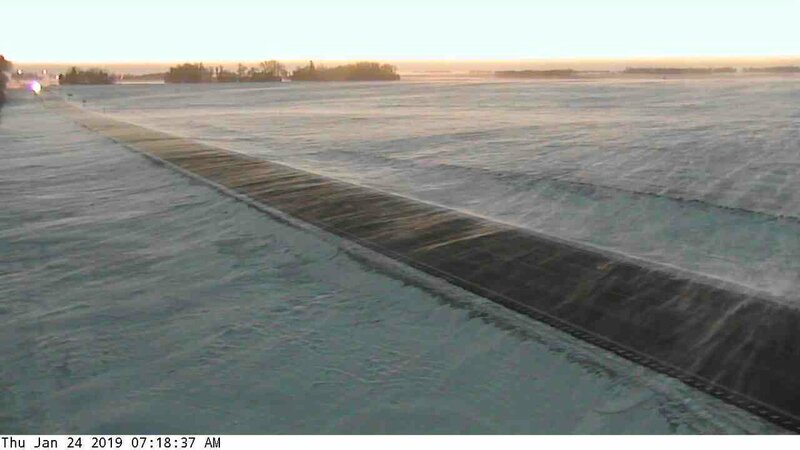 For instance, on the 30th, the high temperature in Bottineau, North Dakota was -26.0°F (-32.2°C) and the low temperature was -44.0°F (-42.2°C), which became the new record cold high and record low for this day. Aberdeen, South Dakota got down to -37.0°F (-38.3°C) on the 30th, which was its 6th coldest January temperature on record and 16th lowest temperature on record for any month. Aberdeen also had a record cold high that day of -15.0°F (-26.1°C). 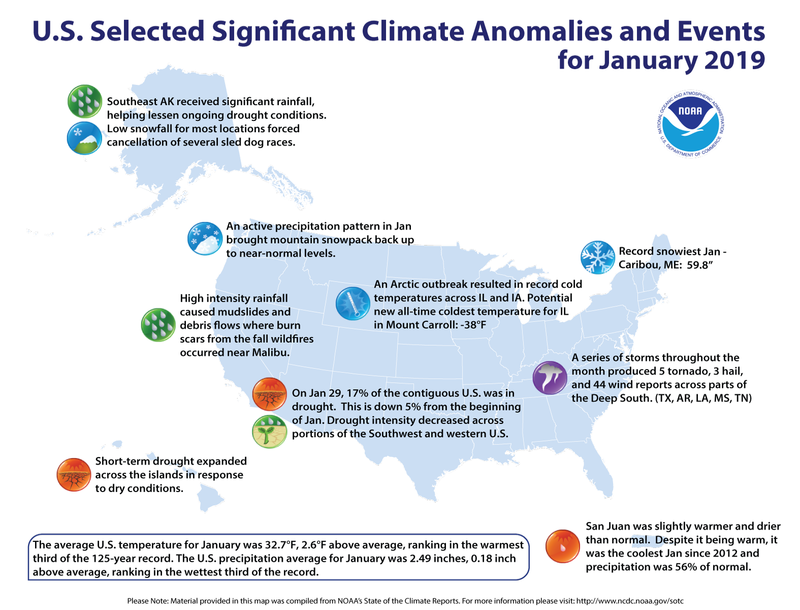 There were 71 severe weather reports for January 2019, compared to the median of 60 reports from 2000-2016. Eight tornadoes were reported during the month. Early in the morning on January 4, an EF-0 tornado with maximum winds of 85 mph (38 m/s) briefly touched down near Abbeville in Henry County, AL. A half-hour later, a EF-1 tornado briefly touched down just east of the Alabama border near Zetto in Clay County, GA and impacted a single family residence. Part of the roof was ripped off from an attached carport as well as a garage. Trees were uprooted and large branches impacted the residence. On January 19, a short-lived EF-1 tornado with winds of 90 mph (40 m/s) touched down on Tyndall Air Force Base in the western Panhandle of Florida. It moved a car, broke car windows, tore a portion of a new roof off some barracks, and flipped dumpsters and garbage cans on their sides. One EF-2 and three EF-1 tornadoes also occurred in Alabama on the 19th ahead of an approaching cold front. The storms caused damage to trees, buildings, and irrigation equipment. The EF-2 tornado in Elmore County, AL destroyed a church in Wetumpka and tossed several vehicles. A weak EF-0 tornado and strong downburst were also observed on January 27 in Hialeah, FL, causing damage to trees and small buildings. In addition to the tornado damage, 45 reports of wind damage were noted. A strong low pressure system on January 23 and 24 brought strong gusty winds to parts of the Southeast, including numerous reports of wind damage to Florida, Alabama, and Georgia and wind gusts of 56 mph (25 m/s) to Charleston, SC and 50 mph (22 m/s) to Washington Dulles. Heavy rain and localized flooding were reported on January 4 in Pike and Upson Counties southwest of Atlanta in Georgia, as a quick-moving low pressure system traveled towards the northeast. Numerous reports of heavy rain and flash flooding were reported in eastern Virginia and North Carolina on January 12 as a strengthening low pressure system moved northeastward off the coast of South Carolina. In January, there were a total of 52 storm reports across Texas, Arkansas, Louisiana, Mississippi, and Tennessee. There were 5 tornado reports, 3 hail reports, and 44 wind reports. Mississippi tallied the most tornado (4) and wind (34) reports, while three states (Arkansas, Louisiana, and Mississippi) tallied 1 hail report each. Mississippi tallied the most reports total (39) while Arkansas and Tennessee tallied the least (2). Oklahoma did not have a single storm report. Only two states (Louisiana and Mississippi) reported tornadoes. There were only 5 days in January where a storm report of any type was reported in the Southern Region, with 48 of the 52 total reports occurring on two days (14 on January 18 and 34 on January 19). For specific regional details, head to this link.